Comet 202943 Go Kart Belt, Comet TC88 Series Belt #883-120, Used in People Movers, Golf Carts, Mini-Bikes, and ATV's. Home > COMET 202943, (SHIPS AS BX-34 BELT) Comet Industries belt replacement for TC88 Series, 883-120 Go Kart belt. COMET 202943 (SHIPS AS BX-34 BELT) Replaces original Comet 883-120 for TC88 Series. Go Cart Belt #202943. 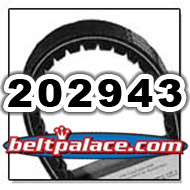 COMET 202943, (SHIPS AS BX-34 BELT) Comet Industries belt replacement for TC88 Series, 883-120 Go Kart belt. Currently OBSOLETE (SHIPS AS BX-34): USE SUBSTITUTE COMET 202943A BELT HERE. Comet 202943 Go Kart Belt. Replacement belt for Comet Industries TC88 Series. COMET 202943 and 202943A. This Torq-a-verter belt measures 5/8” Inch Top Width (.625 inch) x 37-7/64” Inch Length. Symmetric Cogged belt. For use with TC88 Series. This Drive Belt is a common Go Cart belt, Golf Cart clutch belt, People Mover clutch belt, and Mini-Bike drive belt. We offer 100% Secure Shopping! The Comet 200425 (A-DF) Go Kart Belt is exact replacement for Comet Industries belt 883-100. Replaces OEM TC88 Series Torq-a-verter belt. Measurements: 5/8” Inch Top Width (.625 inch) x 33-11/64” Inch Length. Symmetric Cogged belt. A popular size ATV belt, Go Cart belt, Golf Cart drive belt, People Mover clutch belt, and Mini-Bike drive belt.